The Standings is a new strand of poetry, photography and art-science research being developed by poet Lisa Matthews. It brings together poetry and landscape photography, with the words and imagery simultaneously exploring two different narratives. One of these is geographical and the other personal. 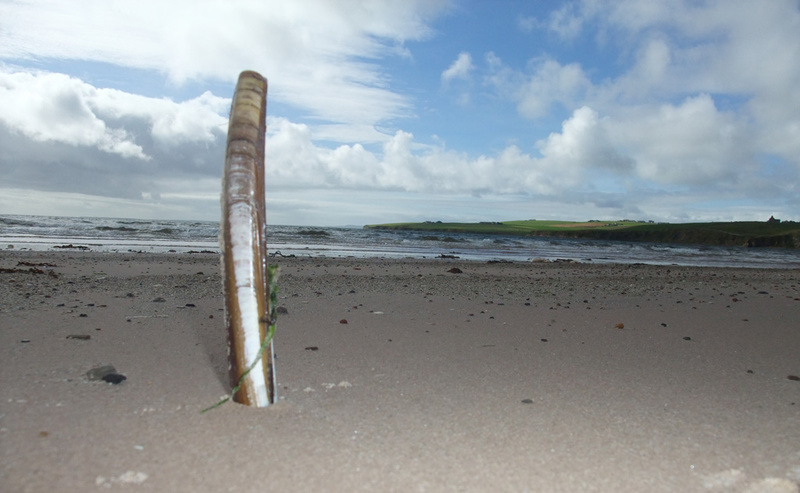 Inspired by a recent (September 2012) research trip to Orkney (funded by Newcastle University),I am juxtaposing natural, island ephemera – objects/things like shells, tides and bones – with the specific man-made standing stones, boat parts and hydrokinetic engineering devices currently being developed in Orkney. The Standings is one poet’s response to the natural and man-made ephemera co-existing in the Orcadian landscape. The writing/imagery exposes and explores, for example: a delicate razor shell washing up on the shore close to where a fleet of German U-boats lie on the seabed; or a hipbone of an animal falling from a cliff side and coming to rest close to marine grade aluminium. Prehistoric standing stones were once the pinnacle of humanity’s technological capabilities – the hydrokinetic engineering of their day. The stones are still in situ and with The Standings, I reimagine the seashore/island ephemera in new contexts and from near/far perspectives in the photography. The objects standing in the landscape tell geographically distinct stories and unearth a more personal narrative of a family member lost to the sea. the wound worn raw by years of swell. the rope still in his hand tied now to my rib. moving closer then fallen away. with heavy skies and hidden silt lines. if we are to remain and thrive. In this project over a 6-month period scientists from across disciplines were ‘paired’ with poets. These couples spent time discussing each other’s methodologies and creative practice and the main aim of the project was to facilitate creative dialogue and provide fresh new vistas from which participants could view their own work and the wider collaborative, cross-discipline terrain. I was paired with a particle physicist and we talked a lot about formulas, rules, scientific assumptions and physical laws. My partner worked in the area of particle flow and introduced me to the Navier-Stokes equations. When he contextualised these complex calculations I could understand something of them. However, away from the creative pairing, I have to respond as a poet. It is interesting to note that this is one of my most popular art/science poems. Both scientists and other poets seem to respond well to it and I am still amazed to have written about such an important and complex equation. In physics, the Navier–Stokes equations, named after Claude-Louis Navier and George Gabriel Stokes, describe the motion of fluid substances. These equations arise from applying Newton’s second law to fluid motion, together with the assumption that the fluid stress is the sum of a diffusing viscous term (proportional to the gradient of velocity) and a pressure term. The equations are important because they describe the physics of many things of academic and economic interest. They may be used to model the weather, ocean currents, water flow in a pipe and airflow around a wing. The Navier–Stokes equations in their full and simplified forms help with the design of aircraft and cars, the study of blood flow, the design of power stations, the analysis of pollution, and many other things. Lisa, along with fellow-writer Pippa Goldschmidt, will be speaking and reading in the Pier Arts Centre in Stromness on Sunday 8 September at 11.30 am in the event ‘Writing the World’ in this year’s Orkney Science Festival. Lisa Matthews was born in Benwell in Newcastle upon Tyne and has lived in the north-east all her life. She has published two full collections of poetry (Postcards from a Waterless Lake and The Deadheading Diaries) and has founded or co-founded several major creative writing initiatives. She has held various writing residencies and fellowships, most recently at the ESRC Genomics Forum, Edinburgh University. As well as facilitating writing workshops in the north east to help people explore their hopes and fears surrounding the new genetics and biotechnology, Lisa also works with medical students and staff in Newcastle and Durham Universities, where she uses literature and creative writing to help trainee doctors become better communicators. Further information can be found on her website.